The human brain is our seat of memory and learning, but it's not as simple as input in, memory made. 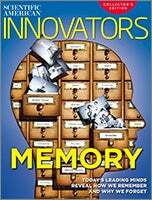 This Scientific American Innovators special issue, Memory, will go through the details of how memories are processed and stored-and sometimes lost or changed beyond recognition. In addition, this 112-page, special edition will highlight the men and women responsible for "A-ha!" moments in memory research-including Oliver Sacks, William James and Sigmund Freud.